As you might have guessed from my cartoon comedy series TOONS, I love animated cartoons. One of the characters that inspired me is Bugs Bunny. He's been around for decades, but there may be a few bits of trivia you didn't about the wisecracking rabbit. Here are seven of them. 1. How Bugs' Bunny Became Bugs Bunny - The character who became known as Bugs Bunny first appeared in Porky's Hare Hunt in 1938, but had no name. Over time, the rabbit made several appearances in cartoons directed by Ben Hardaway, whose nickname was "Bugs." On the model sheet, they wrote "Bugs' Bunny." In Elmer's Pet Rabbit, when they included a title card to officially name the character, they just removed the apostrophe. That's how the character officially became Bugs Bunny. 2. Bugs Bunny is the First Animated Cartoon on a US Stamp - In 1997, Bugs Bunny appeared on a commemorative U.S. postage stamp. It proved a controversial appearance, because Bugs was the first animated cartoon character to be honored with a US stamp. Some collectors worried Bugs commercialized what had been, until that point, a project that honored historical figures. Others were also surprised that the postal service didn't choose the iconic Mickey Mouse as the first cartoon. The stamp turned out to be very successful, and led to others like the recent Pixar stamp sheets. 3. Mel Blanc Ate Carrots - When Mel Blanc did the voice for Bugs Bunny, he had to make the sound of eating a carrot. They experimented with all sorts of things for him to chew like celery, but nothing else sounded like a carrot except a carrot. That's why Blanc chewed real carrots, and spat them out after reading his lines. A persistent rumor has been that Blanc was actually allergic to carrots, and that's why he spat them out. Blanc himself insisted that he's not allergic to carrots. It was just faster to spit them out than to eat them. 4. Hares and Rabbits Aren't the Same - In the Warner Bros. cartoons, Bugs Bunny is alternately called a hare and a rabbit. The titles of several shorts involved a pun on the word "hare" like "Hare Tonic" while others used the word "rabbit" like "Super-Rabbit." Unfortunately, the two are not synonymous. For example, hares are larger than rabbits, and their hind legs are longer. Rabbits live in burrows while hares don't. Rabbit remain the same color year-round while hares have fur that changes color. So Bugs can't be a hare and a rabbit. 5. Bugs Bunny's Carrots Were Inspired By Clark Gable - It's hard to imagine Bugs Bunny not eating carrots. 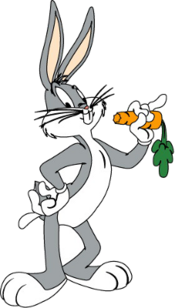 In almost every cartoon, usually when he first appears, Bugs is casually eating a carrot in his hand. It seems to make sense, since we all know rabbits love carrots. Well, not really. Bugs' carrot-habit actually started as a parody of Clark Gable. In Clark Gable's movie It Happened One Night, there's a scene where Gable is leaning against a fence, talking quickly, and eating a carrot. The scene was very popular at the time, especially with Bugs' animator Friz Freling. When Bugs Bunny first did his carrot routine, everyone would have gotten the reference. Over time, the original movie has faded, while Bugs' carrot chewing has lived on. 6. Bugs Bunny is a U.S. Marine - At the end of the 1943 short Super-Rabbit, Bugs appears wearing a United States Marine Corps dress blue uniform. The Marine Corps was so thrilled by his uniform that they made Bugs an honorary private of the corps. Throughout World War II, they continued to promote Bugs in rank until he "retired" as a Master Sergeant. 7. Bugs Bunny Made Demands for Roger Rabbit - Bugs Bunny is seen as one of the inhabitants of Toontown in the movie Who Framed Roger Rabbit. Since Roger Rabbit was produced by Disney, Warner Bros would only allow Bugs to appear if he was guaranteed equal screen time as Disney's Mickey Mouse. That's why Bugs Bunny only appears in the movie in the same frame as Mickey Mouse, and vice versa. Do you know any other bits of trivia about Bugs Bunny? Let me know in the comments. If you love Warner Bros and animation as much as I do, then you'll love TOONS, a wacky and funny adventure set in the world of cartoons. Check it out at the Amazon Kindle Store! So he was on a stamp before Mickey Mouse? Didn't know how he got his name. I'm sure at the time they had no idea his impact on the world would be so big. Speaking of Bugs Bunny, I'm trying to find a specific cartoon, and maybe you can help me? I'm looking for the one where a character is divvying up something between himself and another character. He does the gag of "One for you, one for me. Two for you, one two for me. Three for you, one two three for me. ", and so on. I think it's Bugs? With Google I came up with Racketeer Rabbit, Claws in the Lease and 3 Ring Wing Ding. I watched all 3, but none of those seems to be what I am looking for. Help?! It's going to be finish of mine day, except before end I am reading this great post to increase my knowledge.